As the popularity of pet insurance grows, so do the questions and myths. Here's 5 reasons that people may give for not taking out pet insurance .... and as you will see some of them are just myths! Well go tell this to someone who has had the misfortune of a pet falling ill or getting injured and requiring many thousands of dollars’ worth of vet care! When a pet gets ill it can be difficult to diagnose as they can’t talk to you, so this may mean your vet needs to undertake expensive tests to get to the bottom of the problem – that’s before the treatment has even begun! Like us, pets can get ill at any time, and pet insurance can help with the vet bills when the unexpected becomes a reality. If you have a high disposable income that is definitely an option. But if not you could be better off with a savings plan where you put aside a bit each month to build up a “war chest” of a few thousand dollars in case it’s needed. This requires discipline – so you can be the judge of whether that’s a realistic option for you. With pet insurance you are putting aside a bit each month to pay the insurance premiums, and that can save you from having to come up with large amounts of money at short notice -and many people enjoy the added benefit of the peace of mind knowing that vet bills don’t have to be a worry. Most pet insurance offerings on the market now let you submit your claim forms online, and in the majority of cases claims are paid within 3 working days. It is not a complicated process and vets these days are very familiar with what is required and will help their clients with claim submission. Remember the sooner you submit your claim, the quicker the insurer can pay you. No insurance is designed for individual profit, or to get your money back – if it was like that, then insurance of all kinds would not be affordable for anyone. It’s true that in a year you may pay your premium and not have the need to claim (lucky you, and lucky pet!). But when there is a need it’s good to know that you will have help with the vet’s bills, and a claim in one year can easily offset premiums paid in the last 3 years! In fact, whether you get pet insurance or not is more about getting peace of mind knowing that you will be able to afford vet treatment if needed, rather than a financial equation. Here’s a more complete explanation of how it all works for those who are still in doubt! Most policies these days offer options on coverage, as high as $15,000 each year, and with options on percentage of benefits paid. For example some will pay 60% of the vet’s bills whilst others will pay up to 85%. Naturally you pay for what you get and it’s a question of works best for you and what fits into your budget. So before you get your insurance, we do advise to do your homework carefully before you decide. It’s also important that you choose an insurer that you plan to stay with in the long term, because pre-existing conditions are excluded in every policy – so if you’ve made a claim on one policy, then the condition will not be covered if you switch to another provider. Generally though, the insurer will continue to cover the condition if you are continuously insured with the one insurer. Most of us see insuring our car as a necessity – so why not your pet as well? 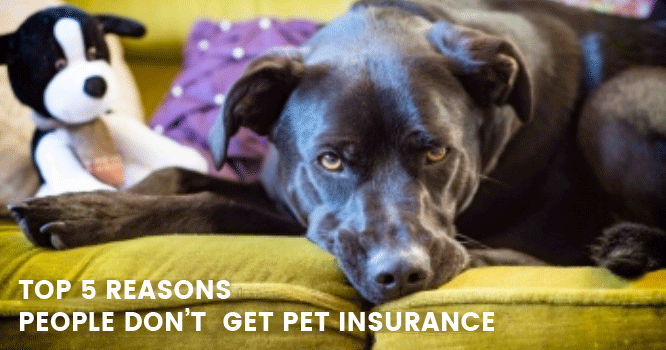 If you have other reasons for not getting pet insurance, just let us know! Liz Walden has a passion for all things cat and dog, and was one of the first in Australia to bring Petsecure Pet Insurance to Australian pet lovers. She is committed to promoting and supporting the amazing work done by those who work to promote a better life for all animals. Liz is also passionate about education that supports responsible pet ownership, and strongly believes that all pets deserve the very best care.